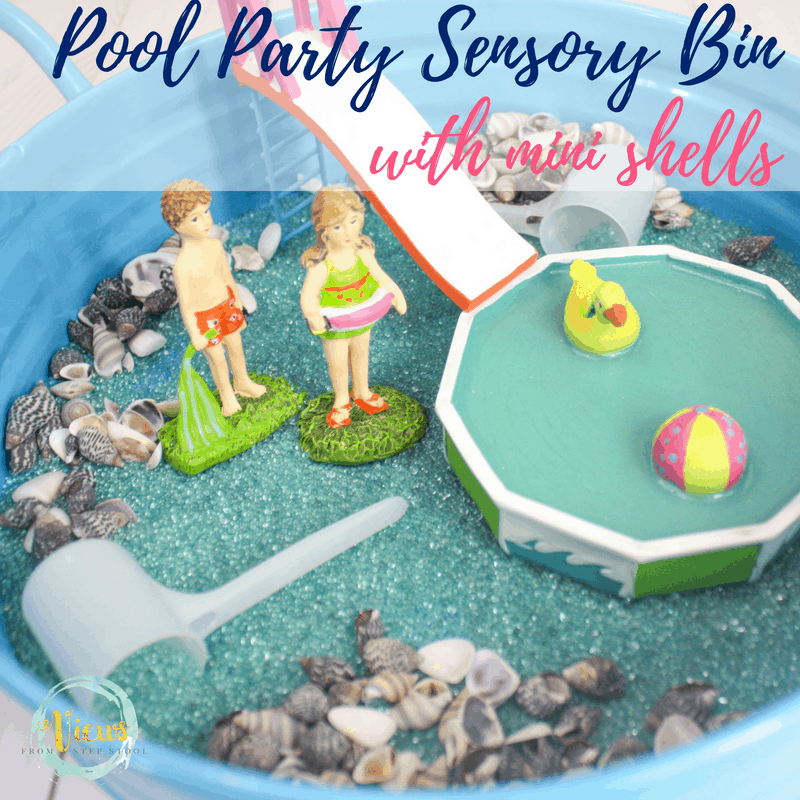 A pool party sensory bin and small world for fine motor practice and fun. Perfect as a summer boredom buster! 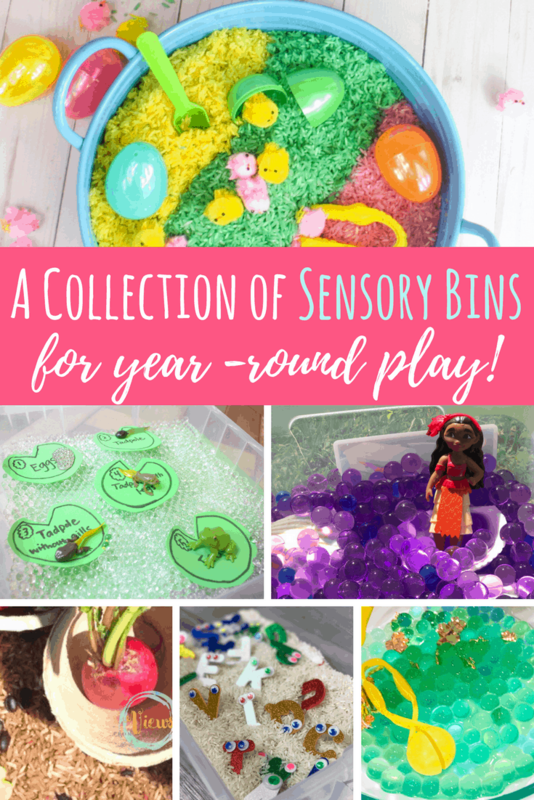 Sensory bins are excellent for early learning, and great for children with sensory-seeking behaviors. 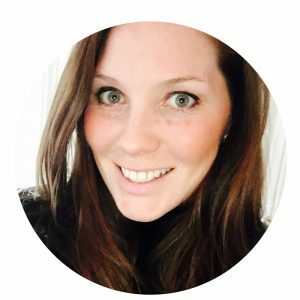 They provide opportunities for rich learning for kids as children are engaged and using many of their senses during play. 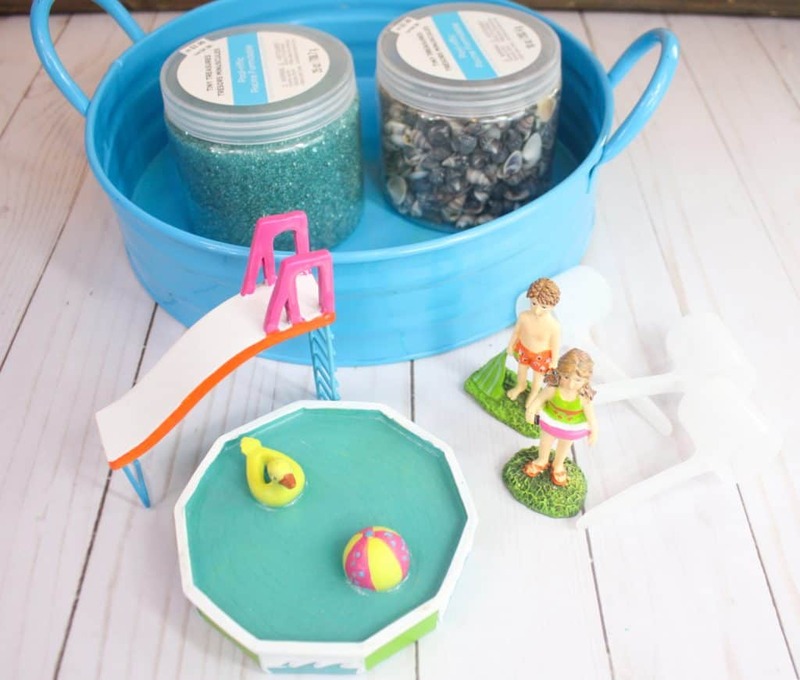 This is a fun one for kids who love swimming, and the pool! This is a little small world that kids can setup and play with. Small worlds encourage pretend play while satisfying sensory needs. It plays on the way kids love to play with dolls or action figures, acting out scenes, practicing social skills, and using their sense of touch to really become involved in the play. I like to use different trays and pans for sensory play depending on what we are doing, but a clear scrapbook paper container like this one with a lid is a sure favorite. When the kids are done playing, I can close it up and save it for another day easily. I also love these metal serving trays because they provide this kind of mini and fascinating feel for certain play setups. 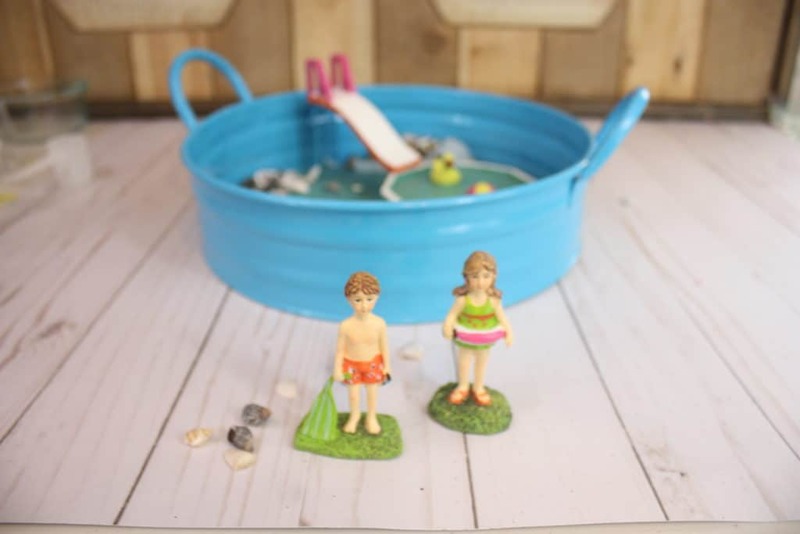 small people figurines, pretend pool, slide etc. Kids love to be a part of the assembly process, and setting up this small world for sensory play is part of the fun! Kids can scoop or pour the blue vase filler into the tray. By encouraging them to use fine motor tools or small scoops for this, they can practice their pincer grasp and use the little muscles in their fingers (great for getting ready to write with a pencil later!). Add some shells to the tray. Similarly, kids can pinch each shell to place in the tray or use small tools for another fine motor workout. 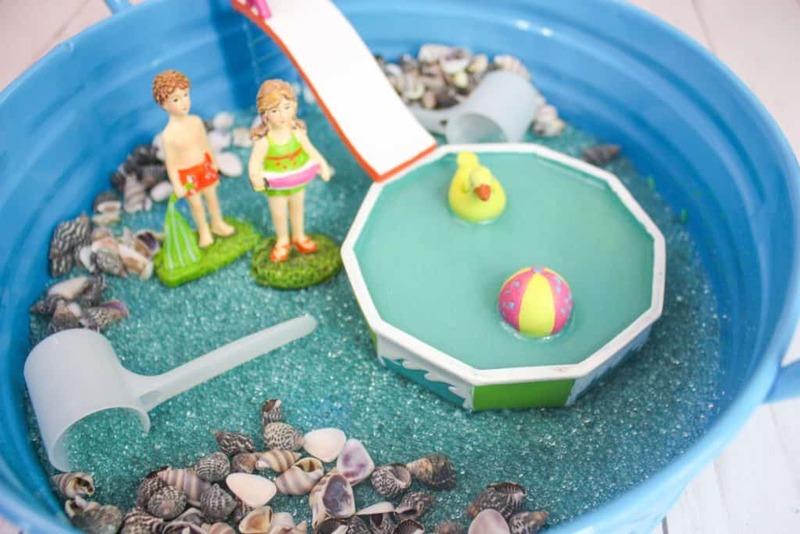 Some kids might even want to get creative and make a design with the shells! 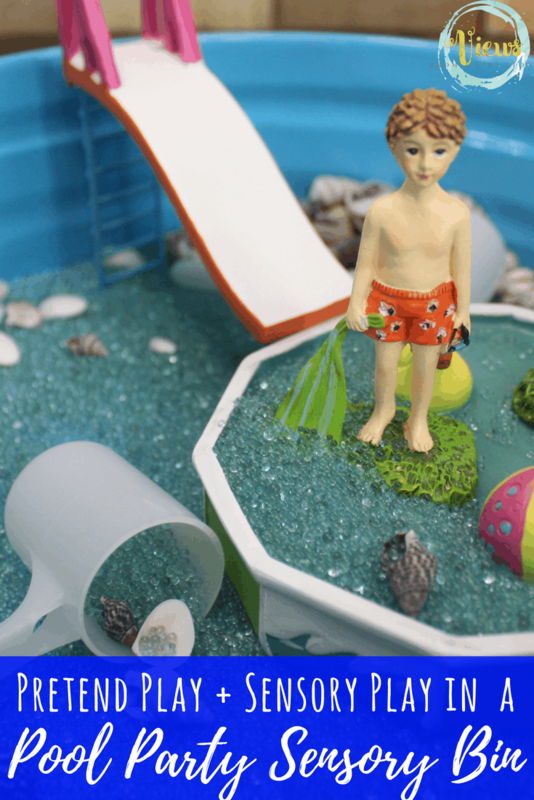 Once the sensory base is in, add some figurines (think fairy garden gear) and get playing! We grabbed all of these materials at Michaels, but you should likely be able to find something similar at most craft stores, or online. 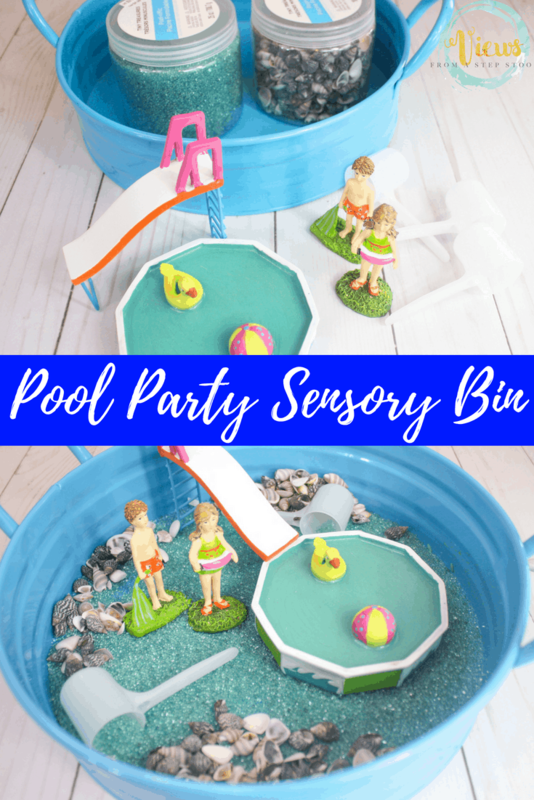 Have so much fun playing with this pool party sensory bin and small world!